Leasing Available from $40.93 per month! Simplify business communication processes with affordable, high-performance printing, copying and scanning, scan to email, faxing, document finishing, and optional digital sending features for demanding work groups and departments. - Maximize usability and minimize training costs. The touch screen control panel features an integrated design for simple copying, scanning, digital sending, and analog faxing. This intuitive control panel is employed across several HP devices to provide users of HP products with a common and familiar walk-up experience. - Transform your document workflow. Add optional HP AutoStore software to DSS 4.0 to effortlessly route information to document management applications such as Microsoft SharePoint Portal Server (version 2003), Microsoft Exchange, and Lotus Notes. - Send and receive documents with the optional analog fax accessory. The easy-to-install internal fax card increases the functionality of your device and improves workgroup productivity. - Enjoy worry-free, self service operation. Industry-renowned HP LaserJet reliability is built into the HP LaserJet 9040/9050mfp and the HP LaserJet Smart print cartridge. - Produce great-looking documents with industry-leading print quality. The product features HP FastRes 1200 and HP Resolution Enhancement technology (REt) for 1200 by 1200 effective dpi at full engine speed. - Share the dependability of best-in-class networking. The HP Jetdirect Fast Ethernet embedded print server provides fast throughput speeds and heightened security. HP Web Jetadmin offers remote installation, configuration, and proactive management. - Count on quality with easy supplies management. The MFP and HP supplies include innovative HP Smart printing technology, which continually adjusts toner properties to ensure professional-quality documents every time you print and provides automatic e-mail alerts via the HP Embedded Web Server when supplies run low. In addition, with the HP SureSupply program, you can enjoy convenient, online ordering. - Achieve professional results. A wide variety of paper-handling capabilities, including an input capacity of up to 3,100-sheets, enables fast, flexible printing and supports custom paper sizes up to 12.3 x 18.5 in. With a range of finishing choices including a new 8-bin mailbox, 3,000-sheet stacker, 3,000-sheet stapler/stacker, and multifunction finisher for booklets, you can produce complex documents in-house, to save time and cut costs. - Boost productivity with two-sided printing, copying, and scanning. The color scanner delivers 600 by 600 dpi resolution for high image quality. A dual scanning head and automatic document feeder provide easy, straight-through, two-sided copying and scanning. The paper trays feature automatic media size detection, so that you'll always be sure you are printing with the correct media. 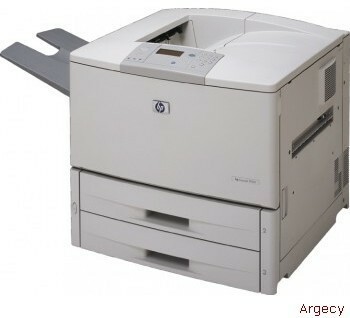 *Footnote for recommended monthly print volume (Multi-function LaserJet): HP recommends that the number of pages per month of imaged output be within the stated range for optimum device performance, based on factors including supplies replacement intervals and device life over an extended warranty period.